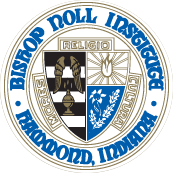 The Bishop Noll Institute crest draws its inspiration from several historic sources: Catholic Central High School of Lake County, Bishop Noll High School, Most Reverend John F. Noll’s Coat of Arms (Archbishop of Fort Wayne and the founder of the school), and Most Reverend Dale J. Melczek’s Coat of Arms (Bishop of Gary). Left Side: The four black and three silver heraldic bars, resembling ingots of steel, signify the origin and principal industry of the Steel City of Gary. Seven bars have been chosen so that the means of Grace, the Seven Sacraments of the Catholic Church, might be represented. The golden angel wings denote the dedication of the Cathedral of the Holy Angels. Between these wings is a golden sensor emitting the prayerful smoke of incense. Upper Right: The light of communication and knowledge is emblematic of the objective of the school and Archbishop Noll, promoter of the Catholic Press and of the school. Lower Right: The stalk of lily resting on oak leaves symbolizes purity and development of mind. This is taken from the seal of the former Bishop Noll High School and Catholic Central. Mores, Religio, Cultura: Circling the school crest are the ideals of morals, religion, and culture. Bishop Noll is built upon these guiding principles: morals, or self-will, is exhibiting good behavior, manners and conduct; religion is honoring the religious foundation of the school; culture is respecting the world in which we live and making a contribution through work and service. Students should expect the character of the school, as well as their own character, to meet the high standards envisioned in the school crest.